Michael Elliott Of Aria Ltd.
Michael Elliott began tinkering with electronics at the age of 13, unconsciously taking advantage of the 60's era of relative component simplicity that invited the taking apart and then rebuilding of radios; the trouble-shooting of failing pieces simply by tugging on certain parts, removing and reinserting others; and essentially learning hands-on through enthusiasm, the occasional hot-wire jolt and the acrid smell of shorted connections. Today he fondly remembers how he first gazed upon wax-impregnated paper capacitors. He wondered what they did besides looking like firecrackers. He figured that it probably was unwise to incinerate them but reasoned that turning at least one of them to ashes was only in the service of higher learning. Kaboom. In 6th grade, the school principal let him take home a Roberts tape recorder to experiment with recorded sound. He grabbed some microphones, engaged in improvised location recording in certain fascinating places and then played it back forward and in reverse. The latter unwittingly started a backwards-satanic trend that's said to still be active today. Kaboom. (Editor's note: So that's whom I really learned that from!) His dad was a Jazz trombonist and Michael grew up playing folk music in the early 1960s. He later jammed on bass in small caf� gigs and during the 70s went through a period as professional musician. His love of audio then compelled him to undergo formal electronics training. Somewhat later, the very same love compelled him equally strongly to retreat. He found the experience lacking a clear focus on audio and music, and altogether too rigid in its presentation of thought patterns and truisms. He's thus practically self-taught and claims most successful audio designers his age or older are, at least those who still actively design good-sounding products in this country. He later did some radio station engineering and eventually launched Counterpoint in the 1980s. In the mid 90s, his professional fame then suffered an intermediate fate similar to that of his close friend Steve McCormack. When the husband-and-wife teams of their respective audio firms headed separate ways, the companies parted as well and folded in the wake of such painful personal events. To stay busy and in the green while preparing to bounce back, both Michael and Steve got into warranty repair servicing for their own components and eventually integrated actual performance updates and modifications. Steve found a new home-away-from-home when Conrad-Johnson acquired the assets and intellectual property rights to McCormack Audio. He was reinstated as chief designer of the now Virginia-based McCormack Corporation and thus empowered to incorporate his latest product revisions into a brand-new line of electronics. With the launch of Aria Ltd. last year, Michael Elliott's status as service tech finally rebounded in series-parallel fashion to Steve's. A completely sold-out first production run of his new amplifiers -- to Japan, home of reputably highly critical and very sophisticated audiophiles -- portends well indeed for Elliott's future. As those who have followed my writings know, I worked for Pat McGinty at Meadowlark Audio in the late 90s. Before his recent move to Van Schweikert's former factory in Watertown/upstate NY, Meadowlark was based out of Vista, Northern San Diego County. It was thus sited in the immediate vicinity of Counterpoint's former headquarters, with my personal digs in Encinitas literally only minutes removed from McCormack's old factory in Leucadia. Leucadia has since turned into the little seaside village that houses Boltz, the steel-rack manufacturer. Meanwhile, Van Schweikert is back in San Diego. Talk about musical chairs. During my Meadowlark tenure, I heard about the final asset liquidation sale of Counterpoint in Vista. Those attuned to the timing of this opportunity could purchase remaining Counterpoint inventory at toupee-lifting prices. McGinty, very fond of Counterpoint's tube-hybrid NPS amplifiers and proudly owning one as part of his then-reference system, was sorely tempted. So was I. Still, we were both too busy to leave work that day and missed out on benefiting from the misfortune of a colleague. In the long run, this was probably much more palatable karma than overtly manifesting cheapskate greed. Who wants to reincarnate as a bloodsucking mosquito? One might be damned to eke out a meager vampire existence off tightwad, salty-blooded audio execs before being crushed to a sorry mess by a cruel hand. When, mid 2001, I heard about Michael's professional rebirth as the operator of his own and new audio company, I felt an immediate kinship. It arises even when you don't know someone personally. You silently cheer whenever anyone gets himself up off the ground to wipe the blood from his brow and starts swinging again with powerful, well-placed punches. I've experienced hard, self-inflicted blows and slow new beginnings in my own life plenty of times to relate. Here I saw an opportunity to do a minor part in helping Elliott gain visibility for his new venture. I'm assuming purely from hearsay and past reputation that he deserves it. A promised review sample, once production of the next run commences, will put me into the perfect position to come to my own aural conclusions on this matter. Today's article is simply a transcribed chat between two music lovers who are nuts enough to bank on making a living in the pursuit of their hobby. When Elliott's 65 employees strong Counterpoint operation closed its doors in bankruptcy proceedings - with an East Coast company buying and then burying the name -- he was surprised at the effects of breathing the sweet air of freedom that came with it. He got to spend much more time than he previously could, listening to and tweaking the components he had designed. That, and now personally interfacing with his customers -- listening to their woes and victories, their individual needs and feedback -- opened his eyes to a whole new world. He became a small-scale but seriously jacked-in designer who could sink his talents into responding to case-by-case scenarios, coming up with modifications that would optimize a particular speaker interface or subtly re-voicing an amplifier in concert with its owner's preferences. This glorified TV repairman existence as he now self-depreciatingly refers to it, became the foundation for today's zero negative feedback Aria amplifier topology. It implements a bipolar solid state output stage in such a way as to remain invisible to the preceding voltage-gain tubed input stage. It also uses what he calls novel biasing and DC offset control circuitry. 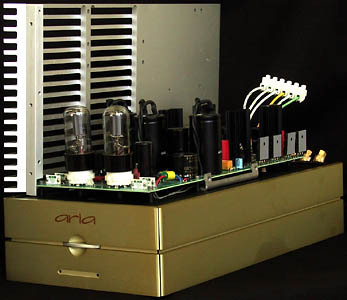 The Aria architecture benefits from the intimate, day-after-day and in-depth explorations, parts swapping, circuit experiments and endless listening sessions that made up much of his time during the Counterpoint repair period during which he revisited many of his mid-80s SA and 90's NPS models. These predecessors represented Michael's first two forays into what is commonly referred to as a hybrid scheme in power amplifiers: a tubed input stage wedded to a -- usually MOSFET - output stage. The second-generation NPS series amplifiers sought to overcome some of the perceived and practical flaws of the earlier thermionic/MOSFET SA marriages and resulted in a stable, reliable circuit. The later NP upgrades for the SA models went sonically further yet. Still, in retrospect, Elliott admits that he still hadn't achieved the clarity and transparency he was after. He recalls how he always dreamed of coupling tubes to loudspeakers, without either a huge tubed output stage or the unwelcome traditional artifacts of a transistorized final gain stage, yet steering sufficient power to the speakers for real-world drive control and transferring the tube sound intact. With his 4th generation WT Whole Tone Aria amplifiers, decked out in classy, brushed champagne and silver aluminum livery, Elliott feels that he has achieved this lofty goal. The tubes operate in a linear and relaxed fashion while the output stage doesn't impart any audible coloration that would indicate solid state. Hesitant to call this - or any other, for that matter - amplifier completely neutral, Elliott points to the fact that these amps remain utterly transparent to tube changes. They fully assume all the attributes of whatever type of tube is inserted into the frontal part of their circuitry. He sees this as a solid indicator about their very high level of transparency. And while he acknowledges that tubes do have a sound of their own, he feels it goes far in repairing the damages wrought by the electronic recording process. To his ears, it minimizes life and body. He calls the Aria amplifiers reliable, transparent and wonderfully musical - "the best-sounding thing I've ever done". His new ad slogan proclaims simply "Tubes done right". Making us all preternaturally wise as we like to envision Socrates or Solomon acted whenever anyone paid real attention, hindsight in Elliott's case refers to Counterpoint's expansion into home theater and - responding to dealer requests - solid-state components. He feels this was a serious mistake since it vacated the firm's core competency of tubed circuits. Further, it undermined, especially in the Far East, a particular and specialized brand reputation, which Counterpoint had successfully generated. To demonstrate his loyalty to the firm's original High-End audio vision when faced with this erosion of repute and support, Elliott decided to launch a second brand under the Counterpoint umbrella. He called it Elliott Audio Science & Engineering, Elliott ASE for shorter or EASE fully condensed. For it, he designed two high-end, fully tubed preamplifiers, the second of which never saw full production since its release coincided with Counterpoint's final demise. The flagship $25,000 Magnum Opus 1 was a remote-controlled line stage, completely dual mono, fully balanced, with 14 tubes in the central audio chassis and two 50-lbs outboard power supplies with another two tubes in each. 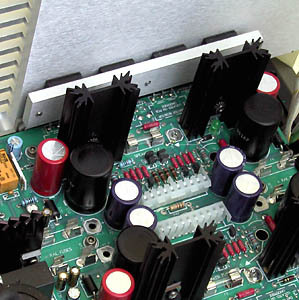 The smaller Magnum Opus 2 or Claritas preamplifier was targeted for a ca. $7,000 retail but remained stillborn due to Counterpoint's severe financial straits that prevented going into actual production at the time. Asked whether he'd revisit these designs now that he could re-launch them under the Aria brand, Elliott immediately reacted adversely. Surprised, I redoubled. 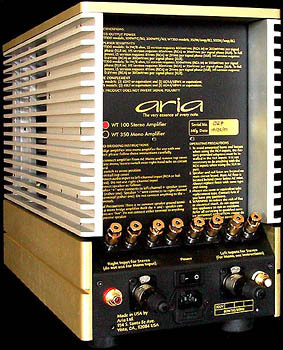 Was Aria going to remain an amplifier-only brand? Quite to the contrary. Fully balanced, tube rectified and regulated line stages with outboard power supplies will be the next products, to be followed - once the current DVD/A vs. SACD audio wars have settled - by a D/A converter. However, seeing that close to 10 years have passed since the Elliott Audio Science & Engineering concepts germinated, he'd implement what he's learned during his extended woodshed period and take a different approach. Besides, creatively he's simply not interested in feeding off already grazed pastures and prefers the greener expanse of virgin, un-trampled territories instead. There are many ways to skin a cat or feather a chicken. LAMM's Vladimir Shushurin designs solely by graphs and claims that his proprietary measurements are sufficient to design superior equipment (which seems validated by enthusiastic critical acclaim for his products.) A well-intentioned hobbyist may design exclusively by ear, either because he possesses no test gear or wouldn't know how to use it if he did. Still, most audio designers like Michael Elliott fall somewhere in-between. Elliott owns rather fancy test gear and knows exactly how to use it. However, he relies predominantly on his ears, and specifically male and female vocals as the touchstones for guidance about the proper blend of warmth, relaxation and freedom from hash and grit. His test gear is mostly used to confirm that the components work properly electrically, produce the power they're supposed to, lack distortion, noise and related issues. He calls test gear a great microscope, a trouble-shooter to help track down ground loops and hum, for example. But in the final analysis, he doesn't care how good it measures if it sounds poorly. Not that I required any justification for this statement, but Michael then cited how he had followed years' worth of exacting measurements by Stereophile's John Atkinson (probably the most experienced independent speaker measurement specialist in our industry) and observed all the accompanying discrepancies and lack of correlation between the published graphs and the reviewers' actual findings and sonic descriptions. The Words to These Arias Are Very Intelligible. When it comes to circuit topologies, Michael is a self-avowed pen and paper kind of guy. He consequently found himself a bit at a loss now, sitting outside a restaurant in Encinitas, cell phone pressed to his ear and an inquisitive Teutonic interrogator on the other end. Rather than going into audiogeek minutiae under those circumstance and degrade our very pleasant conversation into engineering speak techno babble, the following highlights of his Aria amplifiers don't include such details. Alas, here's what I did find out for you. The chassis, except for one copper-plated steel segment, is all aluminum. During the days of the EASE Claritus preamp project, Elliott conducted a lengthy transformer shoot-out and was shocked to find the Plitron brand perform far superior to all others, reproducing another octave of perceived high frequency extension even though measuring identical to the other contenders. He's used Plitron transformers in many of the Counterpoint product updates since and enthusiastically endorses them in his new Aria amplifiers in toroidal versions specifically designed for him. According to Michael, when Vishay purchased Roederstein, the audiophile market found itself in a sudden shortage of good-sounding but affordable resistors. He has identified a secret replacement that he calls one of the best metal-film resistors on the planet without costing designer prices. He also uses a proprietary circuit board material, Audience coupling capacitors and dual Cardas binding post pairs per channel for true bi-wiring. 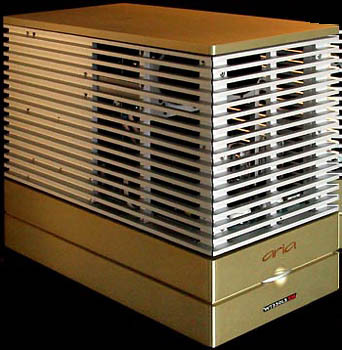 The Aria WT-100 is a 100-watt stereo amp that can be bridged for 350-watt mono operation. It uses four Motorola bi-polar output devices per channel that Elliott describes as extremely rugged and fast high-voltage transistors. 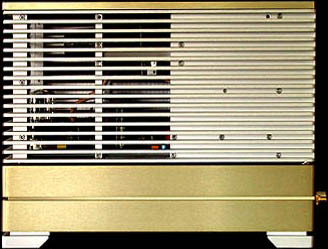 The WT-350 is nearly identical to the bridged WT-100 but cannot be converted to stereo operation. Elliott feels that because it lacks the mono-strap switch contacts, it offers a 2-3% sonic advantage over the bridged WT-100. Both XLR and RCA inputs are offered. The XLR is a true balanced, fully differential input that offers better performance if connected to a preamp with true balanced outputs and interconnect cables of suitable quality. Both the WT-100 and WT-350 are available in 17dB low-gain and 26dB high-gain versions. The 6SN7-based, low sensitivity version accommodates tube preamps that, as a rule, swing at least 4V RMS. It will also be preferable in systems with high sensitivity loudspeakers, to give superior noise rejection. The high-gain version replaces the two 6SN7 dual-triodes of the low-gain version, one per channel, with 6SL7. It's meant to accompany solid-state or passive preamps. Stock tubes are Sovtek 6SN7s and GE silver-plate 6SL7s. Elliott purchased a sizeable cache of the latter for inventory. However, he's the first to advise potential customers to experiment with rolling their own tubes, a fun sport he finds to offer more far-reaching and cost-effective results than swapping audiophile interconnects. Asked which tubes he personally fancies, he hesitated to be specific but eventually cited 1945 Sylvania VT231s and RCA red-based 5962s as good options he enjoys in his personal system. Incidentally, it uses Meadowlark Audio Heroni speakers. He also believes in the importance of after-market power cords and advises his customers to experiment with all ancillary, replaceable aspects around his amplifiers: power cords, cables, tubes and footers. As a marketing guy fully versed in the Art of War tactics that are today's competition for retail floor space between fellow manufacturers, I understood exactly why Michael Elliott had elected the factory-direct distribution route for his new brand. But seeing that there's no free breakfast, lunch or dinner either way, I handed him the high-priced menu of reasons regardless. Alas, I was listening to a designer's perspective. While what I did learn confirmed what I already knew, it's still not easy money medicine that circumvents hard work whether you sell direct or through retail partners. Michael's major frustration at Counterpoint - true for any engineer designing for traditional retail --was marketing dictating not only what kind of products to design, but also at what prices to sell them. This invariably allowed him insufficient funds to follow his aural ambitions for best musical results. Using the typical math of manufacturing for retail, take cost of parts - nuts, bolts, capacitors, resistors, coils, wire, transformers, front panels, cases, rubber feet, packing materials, owner's manuals - and multiply that by three to arrive at dealer cost. Working hard for their living - I should know, I've been there - dealers need to add their own substantial margin. Now reverse this arithmetic from an arbitrary retail figure to arrive at what you assume is the palette of parts the designer has at his disposal to perform his miraculous Sistine Chapel aural paintings with. Alas, you'll have to sink lower still. Only when you divide that figure by at least half once again are you left with those parts that actually matter for good sound. This discounts flashy but - from a sonic standpoint at least -- secondary anodized, CNC-machined stout aluminum front panels; voodoo-ish pointy hats, ahem cones to support the fancy case work with; laser-edged or engraved decals instead of cheaper silk screen; leather-bound manuals; triple shipping boxes to withstand the wrath of Oops; hard foam fillers to avoid banging the fancy casing around the box; thick plastic bagging to avoid scratching said casing with the foam... you get the picture. For a designer, to be allocated $150 worth of hardware to create $3,000 worth of fluffy and airy sound is challenging at best. Depending on your temperament and ambition, it could spell stomach-cramps depression at worst. Simply put, this type of real-world math means that a designer cannot afford to put any of the really good-sounding stuff inside his projects: the darn marketing guys squander most of his vital funds on cosmetics. (Editor: Uh, you sure know how to hurt our guy, Elliott.) And, as the pictures here prove, Elliott doesn't at all discount the need in today's market place for upscale components to look their part. But, $100-per capacitors are plainly outta sight via the regular retail route. Having felt forced into such corner-cutting corners many a times in the past, Michael has elected to remove the retail middleman from the Aria Ltd. brand to insure higher parts quality and thus superior performance at any given price. Still, to go all-out, he had to offer two trim levels for his amps -- vinyl and power-everything leather seats -- to keep the standard pricing in reach of the music lover he wants to serve. The XL versions benefit from bespoke parts like Caddock and Mills resistors, Black Gate powdered graphite resistors, Nichicon Super Through main capacitors, WBT RCA jacks, Van den Hul "The Wind" internal wiring and power supply choke filtration. The XL version, just for these parts alone, adds $2,000 to his factory-direct price for the 100-watt amp. Convert this stout sum into conventional retail markups and you begin to understand the rhyme of Elliott's reasoning. The second verse of that logic came as a revelation to Elliott only after Counterpoint had folded. The inner workings of a large manufacturing firm impose personnel layers between the designer and the end user. Once he saw himself delegated by events to the front lines as a repair's person, he began talking to his customers on a daily basis. He quickly realized how much this direct contact invigorated him. He could answer their questions better than any marketing guy could. He learned more from their uncensored feedback than any corporate brainstorming session ever provoked in the past. He could understand their system requirements and make suitable suggestions on the spot. In short, rather than continue to design for the dealer - who, in the traditional scheme, becomes the manufacturer's de-facto customer who pays his bills - Elliott decided to design directly for the end user. With Aria Ltd., this puts him now in a position where he can support a customer looking for, say electrostatic-type speed and detail, and perhaps implement a minor mod to shift the voicing of the amplifier in that direction. Did you hear me say "voicing"? Darn right, and Elliott was quick to address the fact that this issue flies in the face of the holy credo that preaches how audio equipment should remain as transparent and virgin as fresh spring water, impose no coloration whatsoever but simply squawk -- like a numb nut ad infinitum --"ruler-flat", "distortion-free, "ruler-flat", "distortion-free". In the real world, Elliott has yet to hear a recording that, even over the very best of equipment, reproduces a hi-hat cymbal the way it sounds live. He believes that every designer, unconsciously or deliberately, voices his products in accord with personal ideas of what music should sound like. While individual models will vary slightly, there does remain a certain house sound that carries across a family of products, be they from Krell, Rowland, Cary or Bryston. Some of that's because a designer has developed a bag of tricks, of specific circuit topologies he's mastered, or preferences for certain parts he's developed that work best in his circuits. Still, the reason he eventually settled on those parts and not others, on those circuits over alternatives, is that he decided this is how he wanted it to sound. By extension, consumers do the same. They look for a sense of musical enjoyment that could be exceedingly personal and peculiar but nonetheless remains perfectly valid, if only for them. Hence, why not jump into this reality headfirst as a designer, willing to embrace this process rather than assume a rigid position of "my way or the highway"? But factory-direct selling, despite these very real advantages -- especially from a designer's perspective rather than simply an importer/distributor's -- imposes its own logistical challenges. The first and most obvious one is advertising, whether through word-of-mouth (which depends on existing sales reaching critical mass to snowball, which depends on word-of-mouth, which�), or through audio publications, potentially costly especially via print media. The second hurdle can be funding. As a single proprietor, money can quickly become an issue. Familiar with Paul McGowan's PS Audio approach -- pre-selling production runs of costlier models by taking advance orders -- I asked Michael Elliott how he dealt with the reality of funding limitations. I was surprised to hear that his standard WT models aren't built to order but stocked and shipped with a 30-day return privilege since he insists that a home trial is the only proper way to make a long-term and confident purchase decision. Understandably, XL upgraded versions are built to order and require a 50% deposit simply to purchase the very expensive custom parts. Serendipity helped Michael Elliott clear the first hurdle of good word-of-mouth to jumpstart the second one, sales. When the Japanese audiophile community heard about his reemergence, they ordered the entire first production run so that presently, not a single Aria Ltd. amp, made proudly in the USA, resides in its country of origin. Michael called Japanese audiophiles a very dedicated, thoughtful audience that will generously give you a second chance if you have conducted yourself honorably in the past. While he can't be sure, it seems likely that the first formal review of his US-made product will in fact occur in a Japanese magazine. As a reviewer, I applaud my foreign colleagues for the scoop but hope that home-based writers will get their own chance in 2002 to tell our American audience about these products. Until such time that I can tell you more about Elliott's Aria Ltd. amplifiers from personal evaluations, I'll excuse myself for today and explain why, for those that looked forward to it, my interview with Vince Christian has been postponed until next month. Due to CES-related year-end writing projects for Soliloquy, I was late in calling Vince for our appointed virtual get-together. By the time I did, he had inexplicably vanished or defeated his answering machine, presumably on something mysterious I've heard rumored people do this time a year - take Christmas or New Year's vacations. I wish I knew what that alien custom was all about. Perhaps one day I'll find out. For now, I'm bound for Vegas in a few days to help my friends at Soliloquy man one of their many displays since they'll be over-exhibiting and under-staffed otherwise. I might decide to chronicle my experiences in a future Earwax column along the lines of "the trials and tribulations of being an exhibitor at CES".